Pottery is the art of forming clay in different shapes using arm force and talent, innovation and artistic creativity simultaneously. 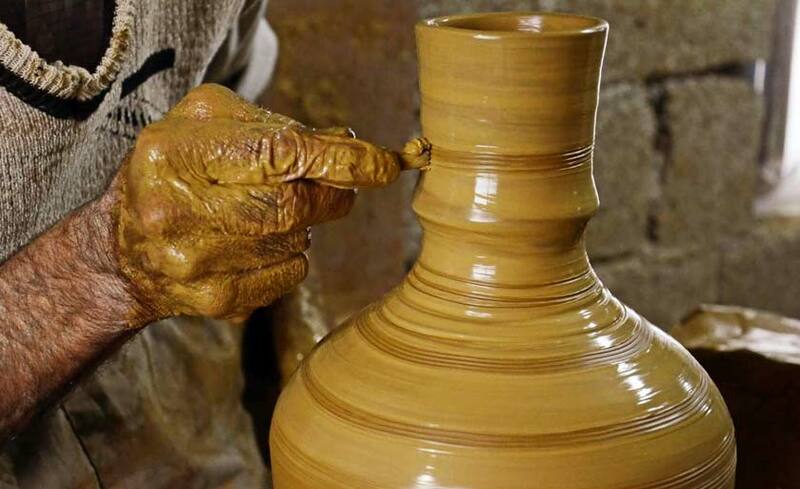 Undoubtedly, pottery is the oldest art-industry which primitive men discovered in nature and applied to meet their spiritual and material needs. The first pottery samples date back to 8000 B.C. They had been shaped without using pottery wheel and baked near fire with no kiln and they had been used for keeping food stuff. Iran plays an important role in this ancient history since the first pottery wheel and kiln have been discovered in Sialk hill of Kashan, the center of world pottery. 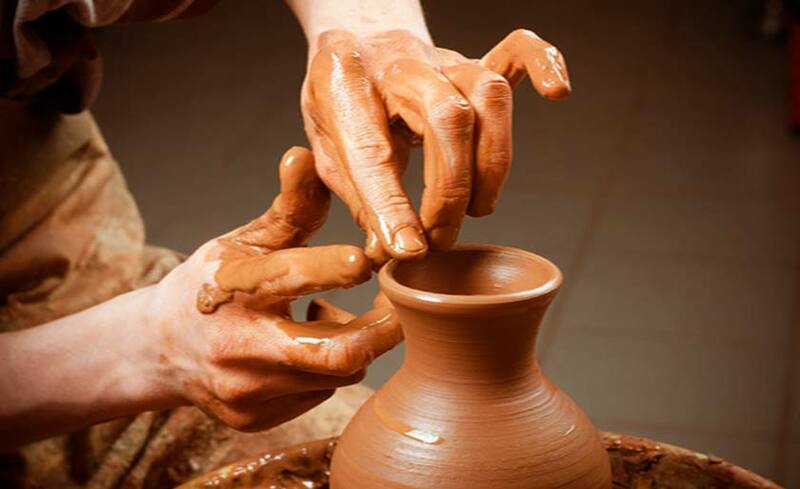 It seems that the invention of pottery wheel in 3500 B.C., in addition to facilitating the pottery, resulted in an amazing evolution in this art which has continued until today. Pottery is usually done with red clay by hand, molding and wheeling, but other clays like black clay and white clay are also used. 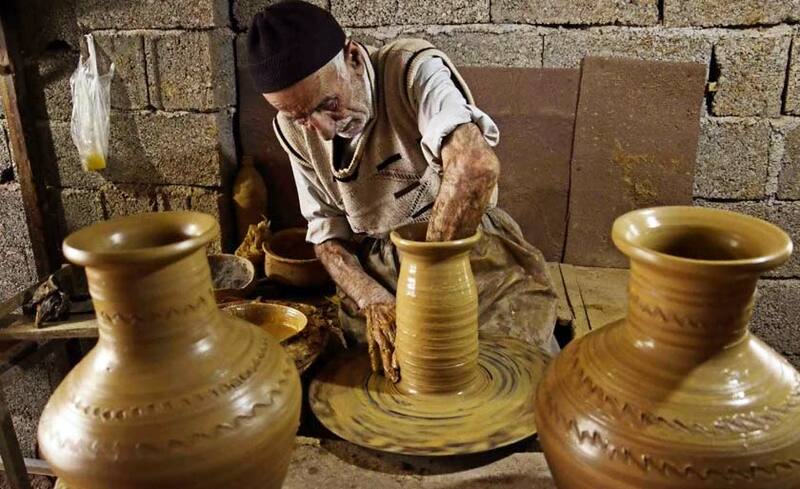 Before invention of pottery wheel, the molding and manual methods were used to make all kinds of bodies and even round receptacles, but after invention of wheel, these methods have been usually used to make dishes which have geometric shapes or ones that it is not possible to make without wheel. The receptacles made on the wheel are concentric and are easily formed in the desired shape. 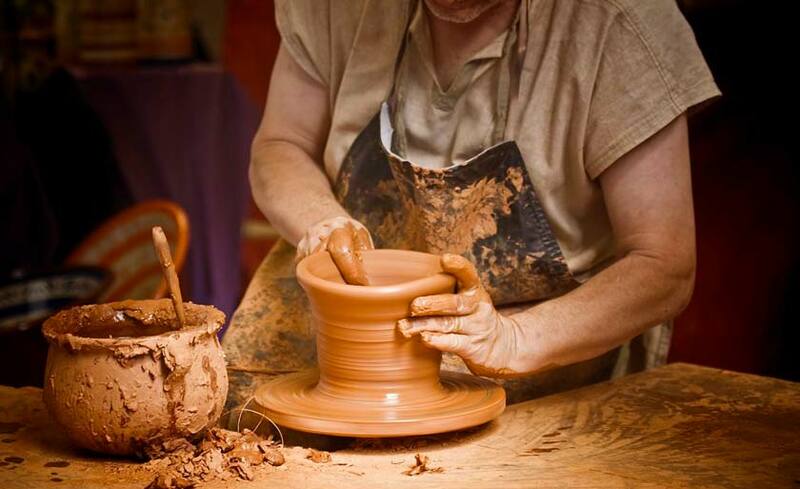 Pottery bodies including hand-made or wheeling receptacles lose some of their moisture after being made, it is called Charmine. Most of decorations which are done on the potteries before glazing are carried out in this step because although clay is soft but it is not sticky and the craftsman can easily perform the designs with tools like carving needle. These decorations consist of different kinds of engraving, embossing, lattice working and cutting methods which change a simple surface to a fully patterned and ornamented one. When bodies are fully dried, they are placed in a kiln and fired at 950°C. The product is traditionally called Biscuit. Receptacles which baked once, after being painted, colored and glazed are baked once more at 1000 °C so that glaze adheres to body. The painting is done by two ways of under glazing and over glazing. In Esfahan most of flower and bird and specially fish designs are worked as under glazing with the name of seven-color painting. Turquoise blue pottery of Shahreza is another example of under glazing painting which is famous in the world, in this work of art black linear designs are shown under a layer of turquoise glaze. Forming white clay by a wheel is of the distinguished products of Esfahan that due to the hardship of its making it is produced a little. Some kinds of white-body receptacles also known as stone-body ones are made in Natanz city which are decorated by method of under glazing painting in two ways of linear and embossing. The delicacy of motifs, lack of crack in body glaze, being light and lack of calcareous articles in clay bodies are among the features which effect on the quality of pottery objects.